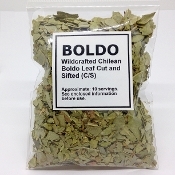 Boldo Tea, Wildcrafted Chile. Aids in liver function, great for a Spring cleanse. Do not use long term, see instructions enclosed.